Once the weather starts cooling down, I always find myself craving cold gin drinks like the Gibson. Every winter, Andrew and I will venture out during one of the many Maine blizzards, when no one else is around and make our way to either J’s Oyster or Dimillo’s. Once there, we will sit and watch the snow come down on the Casco Bay, drinking Gibson’s and eating something that is probably fried. There’s very little in the way of tricks to this drink; we’re using a classic formulation and simply tweaking the ingredients slightly. What is important, as with all classics and three-ingredient drinks, is to be very precise about your measurements and use fresh, quality ingredients. Here we’ve chosen to use Old Tom gin instead of the classic London Dry. Old Tom is a style that predates the classic London Dry; it’s the missing link between genever, a Dutch product distilled from malt and juniper in the mash, and London Dry, a product made from neutral grain spirit with juniper and other flavors added after distillation. Old Tom-style gin tends to be slightly sweeter than London Dry, with a more restrained juniper note. Occasionally Old Tom gin is aged in barrels, but when unaged, as we use below, it offers a clean, bright palate on which to paint a crisp cocktail. Just as important as the choice of gin in this drink is the choice of vermouth. Vermouth should be treated like a bottle of wine. It is not shelf-stable and certainly should not be stored open at room temperature for any length of time. If you don’t anticipate using much vermouth at your house, buy a smaller bottle; most good vermouths are bottled in 375 mL bottles as well, which will make you about a dozen Martinis, Manhattans, or Gibsons, depending on your preference. If you find yourself reaching a week or two on an open bottle, pour yourself a glass of it over ice with a splash of soda and a wedge of fruit (orange or grapefruit work nicely) and enjoy it while cooking your next dinner. In our house Gibson at Hunt + Alpine, we use Noilly Pratt, a classic dry vermouth with a strong herbal backbone. We feel this balances out the softness in the Old Tom gin and ties the drink well to the cocktail onions. 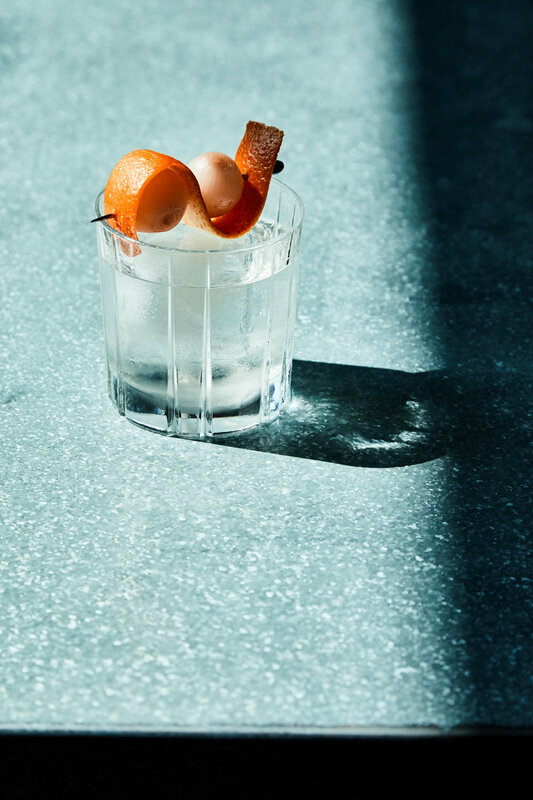 Additionally, we use a dash of orange bitters and express an orange peel over the drink to highlight the citrus found in both the gin and the vermouth. Combine all ingredients except for the garnishes in a chilled 10-ounce rocks glass. Add a large ice cube or several small cubes and stir 30 to 40 times. Express the orange peel over the drink, skewer both the peel and a cocktail onion or two on a cocktail pick, garnish, and serve.